From the day we were born, as women we were told we could have it all; Career, family, home, and a satisfied life. No one gave us an instruction manual. We were just expected to do it all; bring home the bacon and fry it up in a pan. We did well with the first child we did everything the right way. But as the other children came along we began to lose control of our lives. We could no longer be perfect so we just gave up. We were suffering from what I like to call Perfectionism Procrastination Paralysis. Henceforth known as PPP Syndrome. Payroll FlyBabies who suffer with PPP Syndrome have several issues plaguing them. A is for Arrogance, yes this is a characteristic of perfectionism. Our perfectionism keeps us thinking; this is too simple; it can’t possibly work. B is for Beaten Down. We have suffered for a long time. We have worried about what people think. We suffered in silence thinking we are the only one who didn’t know how to keep house. C is for Consistency. This is the one characteristic that we have but we don’t know how to use effectively. We have been consistent at living in CHAOS. We have been consistent at ineffective habits. It is time to use this to our advantage. D is for Decision. We are not good at making decisions. This is why we need someone, anyone to just tell us what to do. E is for Eliminate. With our inability to make a decision we have trouble eliminating the clutter from our homes. F is for Finish. Our perfectionism wants us to finish anything we start. This is how we have been taught. We can’t help this but we can learn a new way of thinking. This is our home. G is for Good. Good enough is good enough! Our perfectionism wants what ever we do to be perfect. You know how we can hyper-focus on scrubbing tile with a toothbrush. Don’t let this paralyze you. H is for Habit. That has been our problem, we don’t have habits established. We don’t know how to establish habits. We are here to help you. I is for initiate. We have to get started someplace. Our arrogance says that what good will shining my kitchen sink do for his messy house. Go shine your sink! Then practice keeping it clean and shiny for a whole month. This is how you consistently establish habits. J is for Jump. Jump in where we are. You are not behind. This is at the bottom of everyone of our emails. You don’t have to see the top of the staircase to take the first step. K is for Kind. Please be kind to yourself. You have been beaten up by others for a very long time. Please don’t do this to yourself. L is for Laugh. We have to learn to laugh at ourselves. This light-hearted attitude is contagious. Your family is going to think you have been kidnapped by aliens. No longer are you going to upset when an accident happens. You will be laughing and teaching the children how to clean it up. Be sure and video the clean-up. M is for More. We don’t need more stuff! We have enough. Less is more! Remember this when you go to store to buy more tubs to put your stuff in. N is for Now! Stopping waiting for the right time to get started. Now is the time to let go of our perfectionism. O is Overwhelmed. When we get overwhelmed, our brain shuts down. This is why we need to practice doing one thing at a time. Multitasking is not a virtue. P is for Priceless. The feel of CHAOS leaving your home is priceless. Don’t give up on this feeling! R is for Routines. Each month we practice a new habit. As these habits become automatic; it is easy to piggyback a new habit onto the established one. This is how we build routines. S is for System. The FlyLady System can help you if you will follow our messages and don’t allow your perfectionism to get in the way. T is for Timer. A timer can help you get rid of your Don’t Wannas! When you can’t get started, then set your timer for 2 minutess, 5 minutes, or 15 minutes; and do a countdown. 5, 4, 3, 2, 1, BLASTOFF! U is for Unite! Unite with other FlyBabies in our Facebook Community. Come together and help one another. V is for voice. Your inner voice can be your worst enemy. Quiet those voices from the past. Someone said those ugly words to you. You are just repeating what you have heard. W is for wrong. There is no wrong way to do things. There are inefficient ways but anything worth doing is worth doing wrong. I like to think about this as “Hit a lick at a snake!” Just do something. Anything is better than the nothing that you didn’t yesterday. X is for eXcited. I had to let go of my own perfectionism to come up with this one. Excitement puts a smile on your face. That smile tells your head that you are happy. Happy releases endorphins that make you feel good. If you make it fun, it will get done. Y is for yesterday. Forget about yesterday! It is gone and you can’t bring it back. All you have is the now and tomorrow. Your procrastination causes tomorrow to never come. Focus on the present. Do what you can today and don’t worry about the past. The past will keep you stuck. Z is for Zealot. Became a zealot about FLYing. Your home will soon be the place of peace you have been dreaming about. All it takes is a little doing! Don’t get hung up by needing to know all the details before you get started. Before you know it you will telling others how you got your home in order. 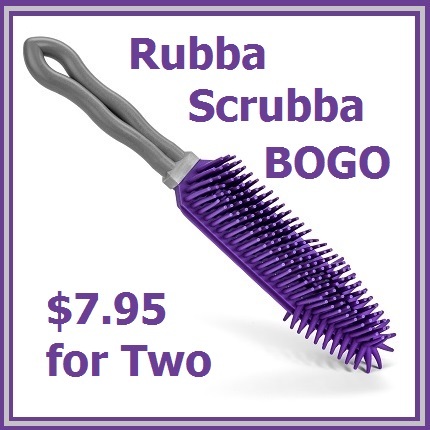 Our Rubba Scrubba is the most versatile little tool you will ever use. We have not had a BOGO on it in several months. Now is your chance to stock up on them. Use a Sharpie to label them. Check out the 101 Uses of this simple tool. Sometimes we need a little motivation. Our efficient tools give us a jump start! They make a tough job fun. If you make it fun; it will get done! 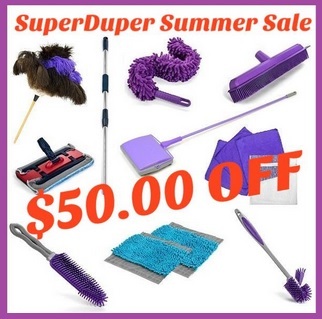 Our SuperDuper Summer Sale ends soon. Use Coupon Code SHOES842 to save 20% on other items in the FlyShop! It is part of the FlyLady Complete Cleaning System! Which is $50 off right now! Without having to use a Coupon Code. This entry was posted in Morning Musing and tagged bacon, career, family, flylady, payroll. Bookmark the permalink.